DINESH NAIDOO is regarded as one of South Africa's leading travel entrepreneurs. With his motto "18 till I die", Naidoo said he tried to enjoy every opportunity that presented itself because life was a journey of memories and the more memories one could make, the better the journey is. 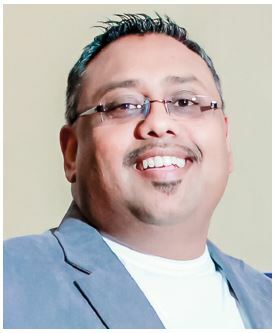 From sponsoring a major IPL team, to producing movies, bringing artists to South Africa, working for the United Nations and being vice president for the Association of Southern African Travel Agents (ASATA) (2005 - 2011), sitting on various executive boards of different NGOs and currently being the president of ASATA, Dinesh Naidoo has led a successful life - and he is only 47 years of age. Naidoo was born in Merebank in 1971 and went to school in the same area - PR Pather Secondary School. Looking back at his achievements, Naidoo said he stumbled into the travel business by accident. After having completed matric, he studied Software Engineering at ML Sultan (now known has Durban University of Technology) but did not feel the passion and decided to go to America with a group of Hindu students to represent South Africa in the Parliament of World Religions in 1993. "I was involved in the National Hindu Youth Federation and various other youth organisations so when this opportunity came to go to America we took it, and this was a life changing experience." Several months later, Naidoo was elected the president of the National Hindu Youth Federation and represented the body in the South African Youth Council. "The South African Youth Council is made up of various political parties and religious organisations. I was taken to Denmark to pre-empt what transformation in South Africa would be like in constitution and governments." While in Denmark, Naidoo got a job at the United Nations working on conflict resolution in Copenhagen for 18 months. Dinesh then started working at a company with an insurance and property division as well as a travel agency. He quickly racked up experience in travel and was asked to manage the agency. Following an educational in India, where he discovered that there was only one operator supporting the South African market, he saw and opportunity. His boss at the time didn't share his vision, and Dinesh decided to leave. Soon after, Carol du Preez and Lal Jayamaha and Dinesh started Serendipity Travel in October 1996, and together grew the brand and expanded its footprint. Since its inception, Naidoo has been involved in many concerts, bringing down various artists from classical (karantic) to Bollywood for the past few years. A highlight for Naidoo was in 2009, when he had the opportunity of sponsoring the Deccan Chargers in the IPL in South Africa. "Being friends with the team owners and spending six weeks with the team will definitely be a highlight in my life. I spent time with people like Adam Gilchrest, planning and strategizing in taking the team to champions in 2009." His next milestone came through producing the movie, White Gold in 2010. "I had been distributing South Indian movies and when this opportunity arose of telling the story of our forefathers coming to South Africa, I could not resist getting myself involved in this project." Naidoo said he had no regrets throughout his life. "I believe failure is a stepping stone to success and if you do not have obstacles in your way you will not appreciate the end results. Some call it luck, but I believe that luck is when preparation and opportunity are taken together." Reflecting on morals and principles, he said it was important for people to believe in punctuality, honesty, and loyalty. "The old way of doing business was very selfish. I use a selfless model rather than a selfish model in the way I operate. I believe in teaching and sharing my ideas with the people around me. The more people I can make succeed, the easier for me to succeed." He said it was important to have good people around because without a good team it was very difficult to move forward. Looking to the future, Naidoo said he had huge plans for Serendipity Travel, and will be opening offices in various countries in Africa and around the world. 'We have our own consortium called Serendipity Worldwide Group (SWG), which is a major grouping of independent travel consortia, this will allow us to reach our 2020 goal of being in the Top 10 travel management companies in the South African travel market.